This little gem has recently set up her net near our porch...I hope she stays a while. Ray: She is gorgeous, Larry. Fantastic shots of this beauty! Ray: She is gorgeous, Elizabeth. Amazing, the body Looks like a tribal mask, Ray. Ray: Yes...that is exactly what it looks like from some angles, Frank. Elle a de belles couleurs mais je ne suis pas fan des araignées. Ray: Elle peut devenir assez grosse, Martine, mais elle ne concerne pas du tout les humains. Elle est très jolie à mes yeux. Ray: Thank you, Lisl. You can barely see it, but She is best known for her effective, but untidy, web pattern. Ray: I expect this is so, Chris. i like how she has braced herself up with her legs paired together, Ray. Ray: This is a very common stance for the Orb Spider, Ayush. I like her jumper that she's wearing.. very flash. You do realise, though, that her and her friends will eat your house within about two weeks? Ah..no.. you've had it treated if I remember. Phew. Ray: She is an Outdoors gal, Alan. 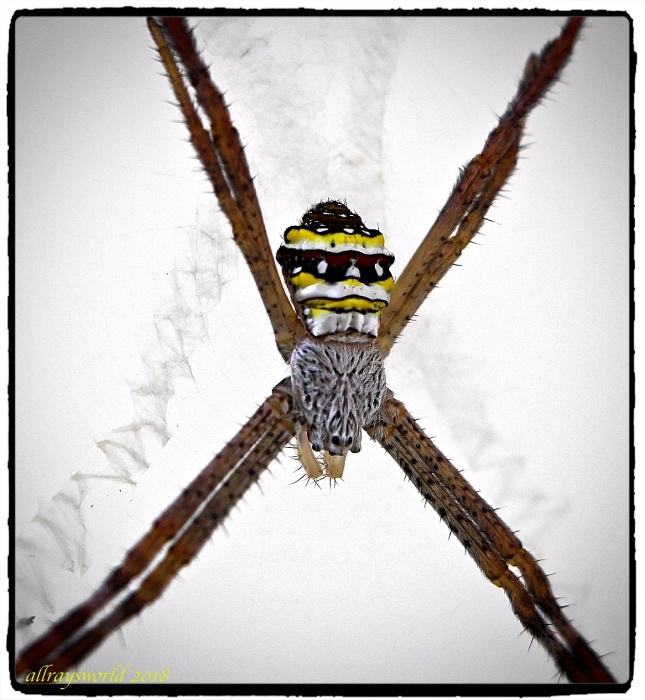 What a fascinating spider and what a great image! Ray: I like Orb Spiders, Philine. They can grow quite big. It looks like an offensive weapon to me Ray. Ray: She is a Hunter, Chad! Those are some nice textures! Excellent captures, Ray. This is almost a marvel of nature with a body coloured like that. Ray: She is lovely, Brian. Ray: I would not be surprised if brooch makers have copied her, Bill. Ray: The Orb Spider is distinctive, Tom...successful, too! It's good to be the queen....she has such a royal look about her.